Are We There Yet, or did you miss it? The billion dollar question (millions being passé now), is “Are we there yet?” Has enough pain been inflicted to justify a market bottom and more particularly for traders, is the market, being a discounting mechanism supposedly looking ahead 6 months, trying to tell us that the party will begin again or at the least, that the worst is over and it’s time to get back into equities. Those investors who rely on fundamentals for their investing decisions can no doubt see some juicy pickings with almost all of the Dow stocks trading at multi year lows. There are plenty of spruikers, those whose living depends on urging you to buy stocks, who are singing the same old song that now is the time to put a toe back in the water. Warren Buffett, the legendary stock picker says that the US economy will be flat for years but he hastens to add that even if he is correct, the market may well rally anyway. Traders have a far easier life. They don’t have to gaze into the crystal ball to ascertain the future. They merely have to pick highs and lows in the markets, execute their trade, and profit from their actions. At the Danielcode we make it even easier than that. We tell them daily what markets to be long and which to be short. Our preoccupation is with turns and there’s an historic reason for that. As a futures trader, market turns are your life blood. Turns create swings. First on a shorter time frame that hopefully morphs to something greater, but even major trend changes start with a turn on the daily chart which is why they are of so much interest to us. Depending what product you are peddling (and your moral fiber), last Friday’s (03/06) low in the big Equity markets was a) the end of the downturn and the return to the norm when Joe Average, and his equally average advisers, could buy the indices with a degree of impunity, sure in the knowledge that growth was inevitable; b) the lows look good but it is the start of a rally in a bear market or c) nobody knows the future, either of markets or other events though some pretend a degree of foreknowledge. The true answer is c), but without any pretense to foreknowledge. Inescapable logic dictates that at some point all markets turn, and that is where you have to enter. How would you know this? 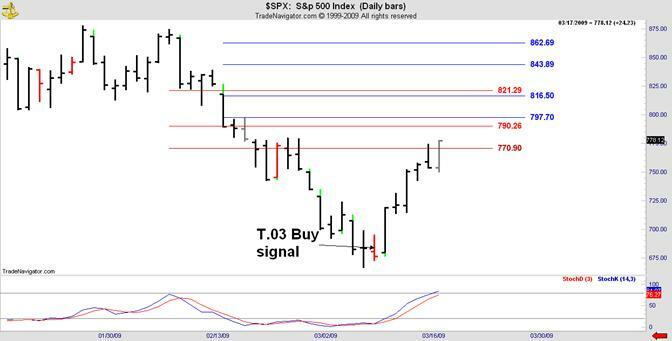 The Danielcode price and time signals signaled the low as early as Friday 03/06. This was our strategy for the important week and it started with our proprietary T.03 time turn indicator issuing a buy signal for the Dow on Friday (03/06) morning, just hours after the close of Thursday’s RTH session. For the next trading session we issued traders’ alerts; and an imprecation to members to be on high alert for a major market turn. What else did you need? There is some important news for Equity traders this week. I have put it with the weekly S&P Index chart so regardless of what markets you trade, please check out my comments at the weekly $SPX chart. Equities are very oversold and on Friday in the face of appalling US unemployment numbers, the markets closed marginally higher, discounting the bad news. In addition, we have contract rollover in these markets on Thursday. Trend changes often happen at rollover or contract expiry (03/19), so we should be on high alert for a significant reversal in the next 10 days. Any rally will be just a rally in a bear market, but they can be vicious and rewarding. Gnostics, those who know (from the Latin Gnosticus) fell over themselves with excitement on the weekend following the $SPX historic close at 666 on 03/06 and the dawning realisation that the Dow had spent time the same day trading either side of 6666. What did it mean? 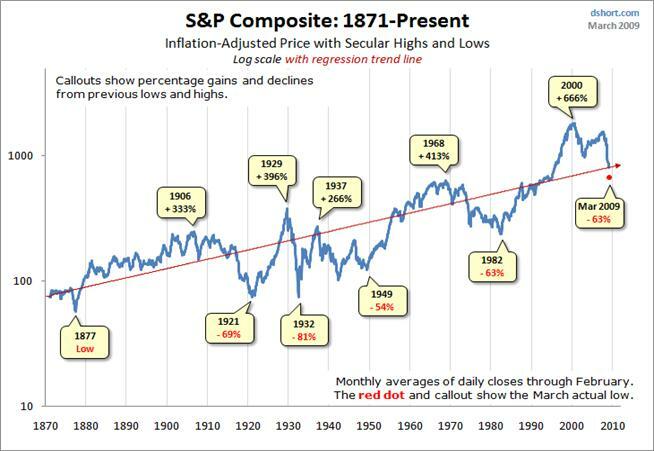 As you see from this chart courtesy of Rob H, the 666 number and its fractals have appeared in the S&P chart before. This one is a log scale. Notice how the 2000 top which appears dominant on this chart was at +666%. In fact 4 of the tops shown on the chart are at recognizable fractals of 666. 1937, the outlier was really a subset of 1929 so it is understandable that it does not resonate with the dominant sequence. Why is 666, its kabbalist cousin 6666, and their derivatives so important to Gnostics? It is the number of the Beast! The recurrence of this number shows the duality of that most heathen of concoctions-financial markets. Contemplate if you will, that the number of the Beast is subsumed by the Danielcode sequences. Here too is wisdom. 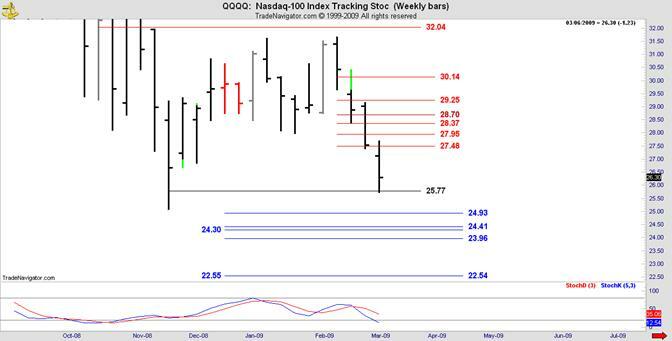 Find the statistical probability of the number revealing itself at the 2000 high and this important low. From the logarithm top in 2000 to the linear top in 2007 is 91 months, just past the square. 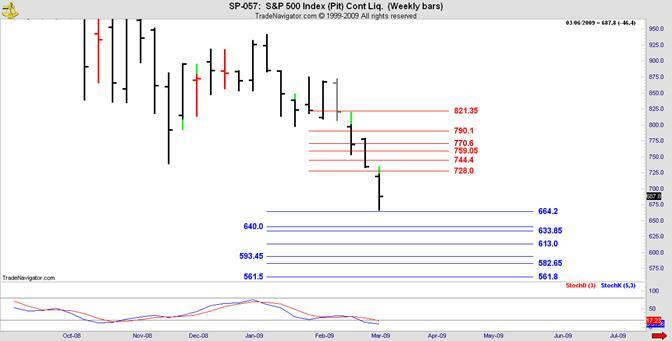 From the $SPX closing low in 2002 to the closing low last month is 77 months or 70+7. Does it mean anything? Of course. By conjuring Revelations, it is not my intent to set off a storm of end time prophesy comments from readers. Please spare me that. Rather it is, as always, to prod you gently with Shakespeare’s words from Hamlet (Act 1, scene V), “There are more things in heaven and earth, Horatio; than are dreamt of in your philosophy.” There is much to learn is there not. And the Russell and QQQQ all precisely at Danielcode support. All of these markets have a high degree of correlation but to have each, at almost exact DC targets simultaneously, is well outside any probabilities implied by chi squared! That was the real clue guys. 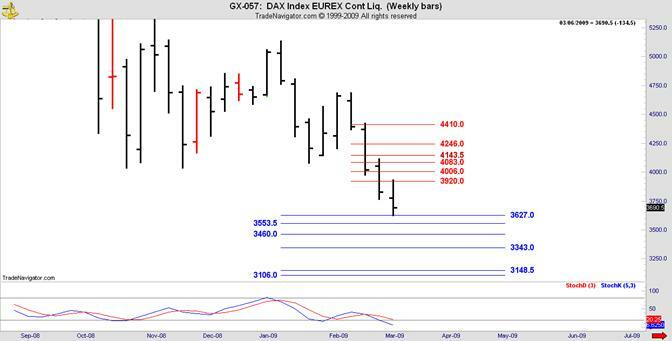 On Sunday night (03/08) I issued T.03 buy signals for the DAX, Russell, S&P indices and the QQQQ tracking stock, as well as T.03 sell signals in Gold and Silver. 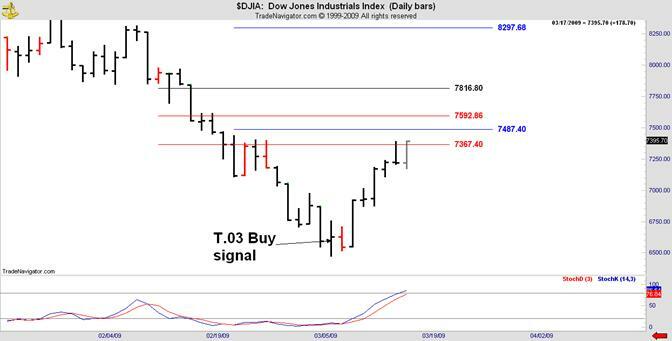 Remember we already had a T.03 buy signal for Dow from Friday. What transpired made last week’s trading a bonanza for Danielcode members. The Dow rallied over 14%, the S&P roared to the DC black line at 767 and most markets arrived at significant swings just in time to complete St Patrick’s Day festivities for those traders who knew the turn was imminent. Not many did. Well worth a pint or four, don’t you think? While the trading low for this cycle is probably in, it is highly unlikely that we have seen THE low for US Equity markets. From an investor’s perspective what we have been seeing are desperate efforts to support manufacturers, house and commercial property prices and finally Equity markets. All these are judged as political imperatives, and have been universally adopted by all significant economies. Soon, in the face of apparent market carnage and under the ever plausible slogan “We’re from the Government and we’re here to help”, you will see the biggest transfer of wealth in history as Governments underwrite sales of not so toxic assets to selected corporates, at fictional values and practically on a non recourse basis, but that’s a topic for another day. Mark it down and note it well. It will be a seismic event, but as always, only the anointed. will be invited to play. Not you or I. For traders, our simple and relatively uncorrupted game is to buy the lows and sell the highs. 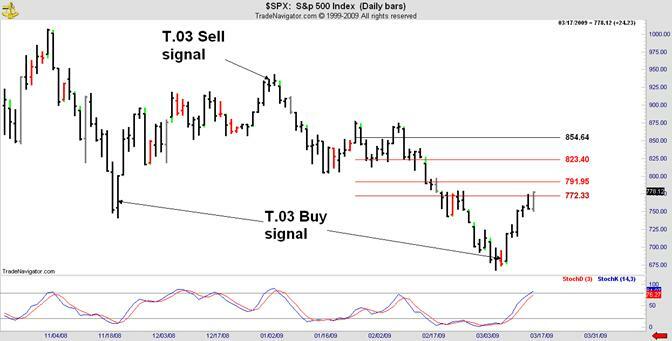 Nothing in the Danielcode tells us whether the signals for market turns that it generates will be temporary, offering a short term trading opportunity or terminal, signaling a major trend change. We have no foreknowledge of market direction and nor do others, although some profess knowledge never granted to mere humans. We can however quantify the probabilities with the most common and unsophisticated of indicators. The most satisfactory solution is to take the trades as they set up and manage your stops aggressively to minimise risk. 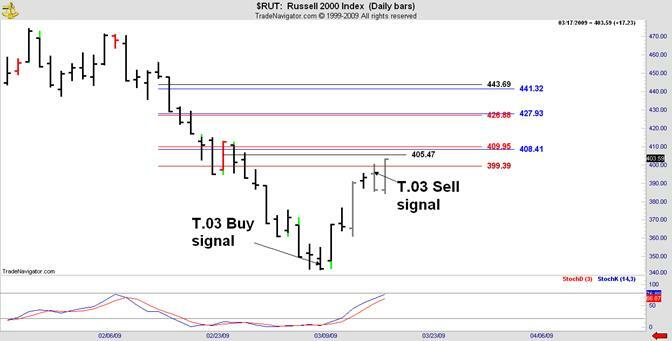 All market turns start with a turn on the daily chart, and where else would you want to buy if not at the lows. Our Gold trading has been somewhat overshadowed by the massive moves in Equities of late, but they have been just as precise and accurate. This is the current Comex Gold chart from the Danielcode. It looks busy because it is. 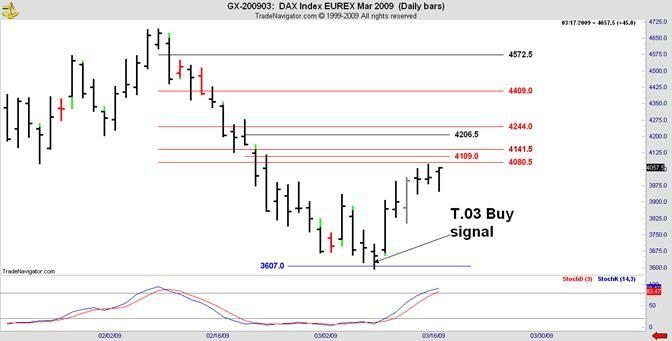 The gold market has been a trader’s dream, firing off well marked reversal signals and following through on 5 of the past 6 T.03 turn signals. In today’s Gold video posted at the DC website I discuss the recent T.03 signals in more depth and we look at the entries and exits on 240 minute and 720 minute charts. The videos are of course free and I invite Gold traders to take a closer look at these trading signals . 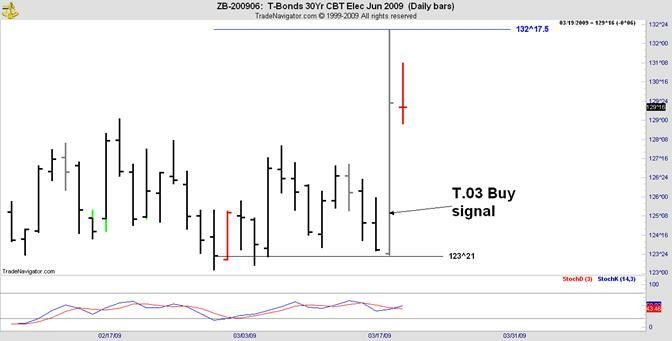 To my knowledge this precision in market price and timing signals has not been achieved before, and the Danielcode T.03 signals seem to generate much the same results across Gold, Equity indices, Commodities and Forex. In the trading game, most specialise in one or just a few markets. At the Danielcode, DC number sequence price targets and T.03 time turn signals are generated daily across about 30 markets. I invite you to see for yourself and find out how trading and keeping your money in your own hands beats the alternative. Hands down! Thank you for your hard effort and service. I subscribed this summer (to DC) but dropped out after ignoring many of your signals because I stubbornly held to my belief that gold was going vertical. That cost me a pretty penny. Trading and fundamental investing are two different beasts. I started up with you again 2.5 weeks ago and have traded my account up 25% over that period. Not too shabby. Great call old friend. You were most accurate of all pundits IN THE WORLD ! 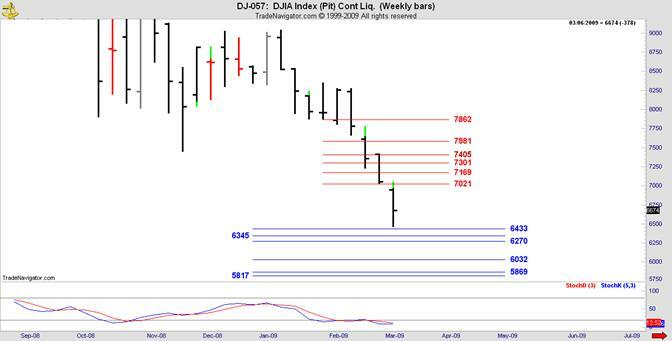 Whilst we loved this trade, in truth it only continues what the Danielcode does every day. The same signals give differing degrees of motility, and hence reward in the ensuing trade, but we were confident enough in suggesting that a major event was near, to put it in black and white on Sunday (03/08) fully 24 hours before trading commenced on the Monday. How many others did that. To the day and a handful of points now? John, I thank you and my family thanks you for sharing this wonderful knowledge with us. It is a blessing in our lives and giving us the opportunity to stay afloat in this difficult time. Since becoming a subscriber, I have not had a losing trade. You have certainly had a great start with the Danielcode, Peggy. And you have discovered its true purpose. The Danielcode is a gift to me; and as I have been instructed, it is now my gift to you and yours. Learning trade management to minimise losses is the key. That is a subject that all those derivative traders, working for now household names, and grabbing their multi million dollar bonuses failed to apply. If they ever knew! When is the penny going to drop that those overpaid and cosseted traders, constantly espoused as “the best and brightest” and deemed worthy of a kings ransom in bonuses annually, are the very turkeys who bought these once great trading houses to their knees. As for the latest rubbish that the best lawyers in the land can’t stop AIG from paying these scandalous bonuses; send them Down Under to see me. I am but a humble country lawyer of an advanced age and well past my prime (and probably my use by date as well), but I assure you I could stop those bonuses with one phone call. Are these guys for real, or is it just an expensive game with you paying the bills? But don’t get me started on the charade being played out in Washington. Ever time Government tries to dance with business they get done over. And it’s easy to see why. On one hand are not very worldly public servants, and politicians whose main talent is to be liked. On the other side are career wolves and vultures whose talent is to get the money. Doddery Dodds, Gullible Geithner and not so Frankly Franks. What a team. Go figure the likely outcome! Whatever the future direction of markets, you can be sure that waves of volatility will return periodically. The realisation that the great corporate names of a generation turned out to be so fragile, and so much of their balance sheets were fantasy, has changed the game. Much remains to pass before a degree of clarity in stock valuations return. I suspect reality will prove a profound burden to a generation who have been weaned on unsustainable market beliefs. I wrote in Financial Sense more than a year ago that the only vision of Governments, and not just in the US, was to restore the status quo ante, and that meant debt securitization. Obviously nobody is going to put their head into that particular tiger cage without some serious guarantees. And that’s just what US and Australian governments are doing. The Fannie/Freddie explicit guarantee on mortgage backed securities is being extended to a huge range of other products including small business loans, auto loans and other securities. And on a non recourse basis, meaning that if the borrowers default the government owns the problem. And that means you guys. Did you know that your largess, not only to your own countrymen but also to foreign corporations was so widespread and compassionate? Of course the same guys doing it now are the guys who did it then. Comforting or ridiculous? I’m in the latter camp. Wednesday’s FOMC meeting defied the normal pattern by shocking the US Dollar index, US T Bonds, many Forex pairs and Gold and Silver. I’m not sure why the markets were so obviously taken by surprise, as the prospects for quantitative easing had been well telegraphed by the Fed months ago. What was fun, was to see that the Fed is still using the Danielcode to define their surprises. They may not know that they are following the DC signals but they are, and I have written about this phenomenon for you on other occasions. All markets are defined by the Danielcode and even the US Fed is obliged to conform. As a stress test of the validity of the Daniel number sequence, this was a beauty. Coming into Wednesday’s trade, we had support at the famous DC black line which marks the last level of support for the operative swing and that had been sitting on the DC members chart for 8 trading days at 123^21. 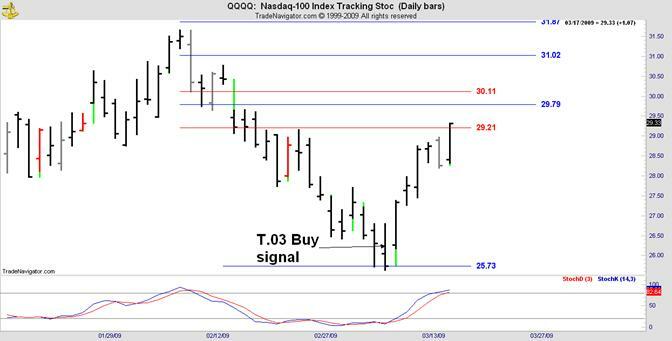 Our T.03 Buy signal for T Bonds in Wednesday’s trading session meant that we were on alert to buy this market on either Wednesday or Thursday as the T.03 signals are valid for 2 trading days. As it turned out, we didn’t have to wait long. On Wednesday, T Bonds opened at 123^25 and dropped to make its intraday low at 123^23 just 2 ticks from its DC targeted support. From there it was all up as T Bonds went ballistic with the Fed announcement, to record a daily range of over 8 handles or 265 ticks, as it charged up to make its daily high just half a tick from the DC blue line target at 132^17.5. This extraordinary range day will be a mark on the chart for years to come. There is nothing comparable in recent memory. In the midst of these sensational market gifts, I hosted a 3 day, Danielcode “Super Traders” tutorial for traders from Australia, America and Dubai in Taupo, New Zealand on the edge of the Great Lake, world famous for its rainbow trout. This is the view from my trading workshop and garden. After an introductory dinner and 2 days of hard labour over the DC charts, refining our trading skills and trade entry techniques, and initiating this group into some of the myriad mysteries of the Danielcode, we regrouped on the Thursday for a cruise/fishing safari on this natural wonder which is the biggest fresh water lake in the Southern Hemisphere. It sits in a long dormant, sunken volcanic cone, about 120 miles in circumference and is almost 1000 feet deep. The Lake is fed by the snow melt from Mt Ruapehu, a still active volcano which you can see in the distance. That’s our local ski field and it’s just a 45 minute drive from my home, across the lake. Our group of 12, with wives and friends made a poor start by scaring the local trout which are suitably wary and only getting them about half way into the boat. Some internal lubrication was required. Eventually the first fish was landed and we did what all good fishermen do; we “blessed” its head with various wines and ice cold beer. You must understand that if you don’t bless the head of the noble fish, the first catch of the day, you will never catch another! Eventually, as in all things, technique was refined and we started landing some nice trout. The star of the show was Peter VA, an expat Dutchman and dedicated Financial Sense reader who made the trip from Dubai with his lovely wife Anne. Here is what a highly stressed Danielcode trader looks like after our intensive training laboratory. Holding up in fine shape, I would say. As our traders were all obliged to start on the trip home the next day, they were forced to leave their catch in New Zealand, and that meant that the Needham family has been dining on Lake Taupo trout for the past 10 days. Baked in foil with just salt and pepper and a squeeze of lemon from our bountiful lemon tree; I assure you, there is no finer fish in the world. Gifts in the markets and gifts from the Lake. Our cup runneth over!